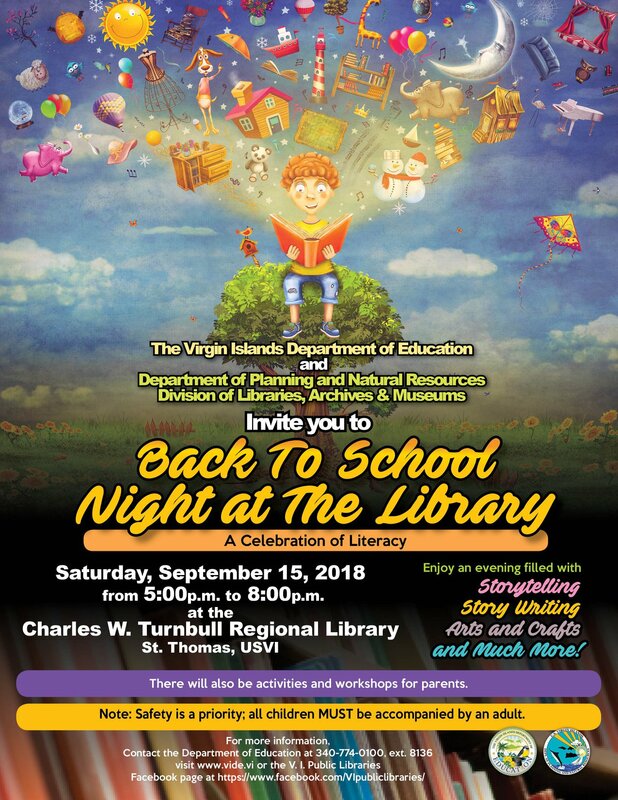 The Virgin Islands Department of Education and Department of Planning and Natural Resources, Division of Libraries, Archives & Museums invite you to Back to School Night @ Your Library! Join the celebration of literacy on Saturday, September 15, 2018 from 5:00pm to 8:00pm at the Charles W. Turnbull Regional Library on St. Thomas. Enjoy an evening filled with story telling, story writing, arts and crafts, plus activities and workshops for parents. Please note that the safety of all children is priority #1 and ALL children must be accompanied by an adult for the duration of the event. For more information contact the Department of Education at (340) 774-0100 x 8136. Or, click on the image to download and share the flyer.